Hey guys! I'm back from the land of smiles! I will be having a post on my getaway under the new tab 'Escapade' in a week or two. So do keep a lookout for the update! This week I had my lunch in this restaurant situated at Art House (second floor of timbre), Olivia Cassivelaun Fancourt! 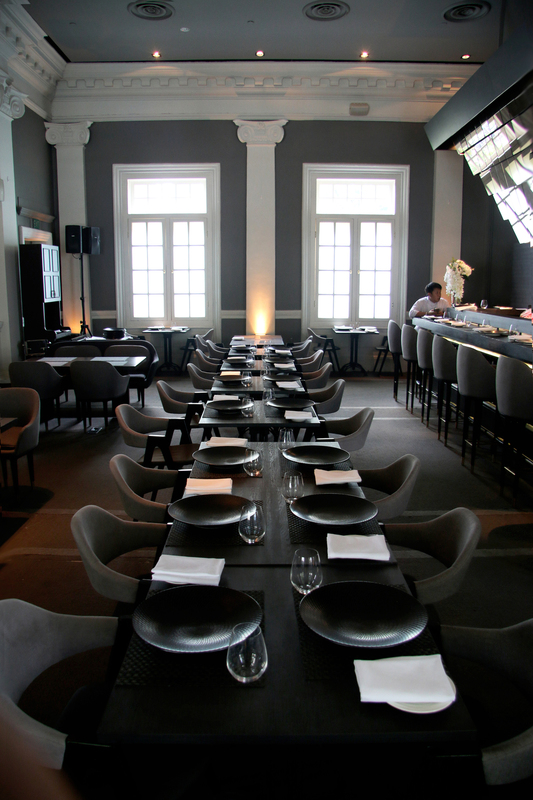 OCF is a french fine dining restaurant house by Executive Chef Jonathan Koh. With a open kitchen concept in place, a live music set up for jazzy performance by local talents to go along with the well executed food. This could be the restaurant to impress your date(s). OCF serves menu that change according to the freshest ingredients of the season. If you are adventurous & will like to try something off the menu, you can opt to go with their 'Pre-theatre' set course and the chef will decide what to cook for you. Executive 3 course lunch set at 38++/pax. Thinly sliced to perfection scallop carpaccio. Appetizing with caviar and greens. I still remember vividly the texture of the pork collar, along with the chestnut puree, glaze & yellow bell. Too beauteous to eat it! All in all, I had a wonderful dining experience with OCF and I will be sure to go back again!